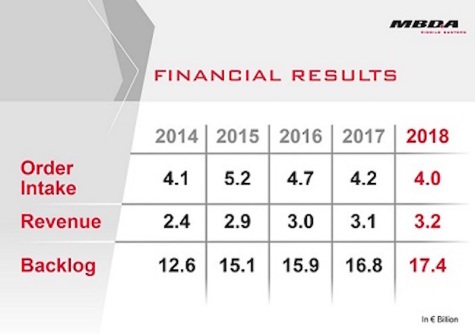 MBDA saw another strong year of trading performance in 2018, recording a further €4.0 billion in orders that brought the company’s order book up to a record total of €17.4 billion. Revenue was also slightly ahead year-on-year to €3.2 billion. Strong performance in our home markets saw MBDA’s domestic order intake of €2.5 billion exceed that from exports at €1.5 billion. Significant domestic orders in 2018 included a contract from the French DGA to develop the next generation of the MICA air-to-air missile, the renewal of in-service support for the Aster missile across France, Italy and the UK, upgrade and maintenance work on Taurus in Spain, among others. Major export orders included the weaponisation of Eurofighter Typhoon fighter aircraft and NH90 helicopters ordered by Qatar, as well as further export orders of Taurus, MMP and Mistral. This robust order intake has been paralleled by another year of strong recruitment that saw MBDA hiring 1,200 new employees across Europe in 2018 with plans to hire another 1,000 people this year. Important domestic milestones in 2018 that pave the way for future successes include the creation of a joint venture to pursue the next generation Integrated Air and Missile Defence System (TLVS) for Germany. The formal opening of our new manufacturing facility in Bolton in July 2018 by the UK Secretary of State for Defence marked the completion of five years of development and leaves the company well placed to grow revenue in the future. The company also took steps in 2018 to secure European sovereignty in its supply chain, including the joint purchase, together with Soitec of France, of Dolphin Integration, a specialist of System on Chip (SoC) solutions for low power computing applications. The past year also saw MBDA deliver vital new operational capabilities to its armed forces customers, including: the operational deployment of MMP with the French Army; the entry into service of Sea Ceptor with the Royal Navy and major progress on the Land Ceptor system for the British Army; the first firing trials of the Marte ER anti-ship missile; and the entry into service of Meteor, Storm Shadow and Brimstone onto the Eurofighter. 2018 also saw MMP chosen as the missile of reference for the development of a Beyond Line Of Sight capability sovereign to Europe through the sharing of a common doctrine, training and interoperability among European forces under the new Permanent Structured Cooperation framework of the European Union. With a significant presence in five European countries and within the USA, in 2018 MBDA achieved revenue of 3.2 billion euros with an order book of 17.4 billion euros. In total, the group offers a range of 45 missile systems and countermeasures products already in operational service and more than 15 others currently in development. MBDA is jointly owned by Airbus (37.5 %), BAE Systems (37.5 %), and Leonardo (25 %).